Note on 1/8/10: The spelling of Whskey or Whisky has been driving me nuts since this post. So, I did a little research online. It seems like it changes from country to country. Most sources said Irish Whiskey is spelled with an E. So, there. I feel better. It should say “Baked Eggs with a side of Whiskey”. The incredible edible egg. I have a love/hate relationship with eggs. Most of the time I love them, but some days I will flat turn my back on eggs and say I hate them. I’m not fond of scrambled eggs, that’s for sure. I’m a pro at making fried eggs and credit that to my mom who taught me everything I know about frying an egg. She taught me to use medium heat and to not rush it. Simple. Some time ago, I saw someone on Food Network make baked eggs. That really fascinated me for some reason. A couple of months ago, I finally decided to give baked eggs a whirl. I made them three days in a row and it was true love. Angee heard my pleas earlier this week and came to my house this afternoon to shake me out of my chocolate-cake-cabin-fever-pajama-wearing coma. It worked! She has a new bouncing baby Sony Digital SLR and I couldn’t wait to hug it and pet it and take photos with it. She arrived at 1:30 or so and we totally geeked out in my kitchen. 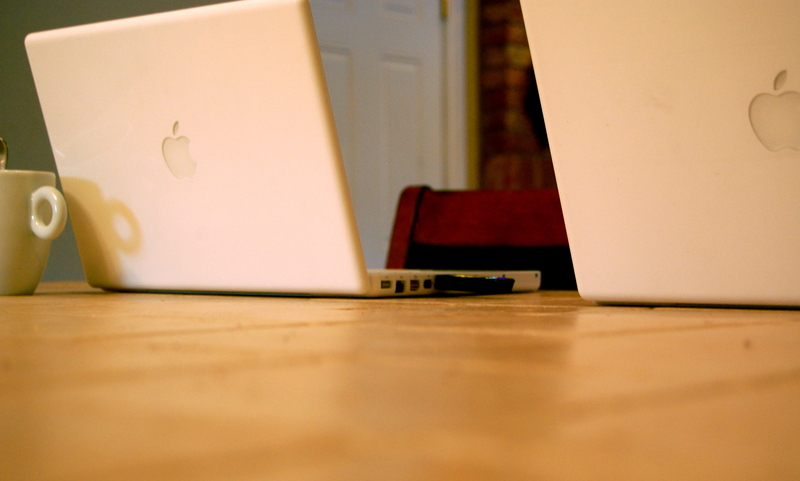 We planned to do some blogging and photos together. Angee made Irish coffee and I made baked eggs. Check out that beautiful cream topping... yum! When Angee arrived, we headed out to the liquor store right away. Let’s face it, when a soccer mom and a school administrator get together, someone is going to need a drink! We actually needed some Irish Whisky for the coffee drink. There should be some kind of disclaimer here because, yes, we ventured into a territory unknown to me before … whisky and eggs in the afternoon. It’s not for sissies. It was very tasty despite my reservations. 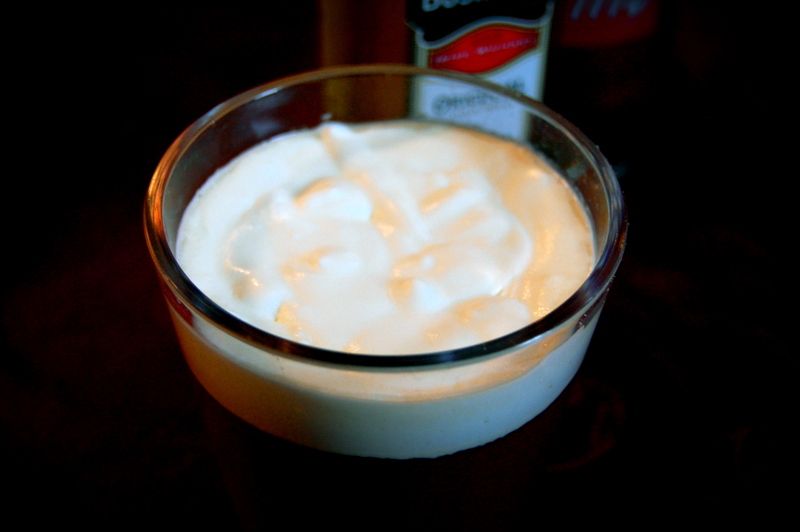 You can find Angee’s Irish Coffee recipe here. 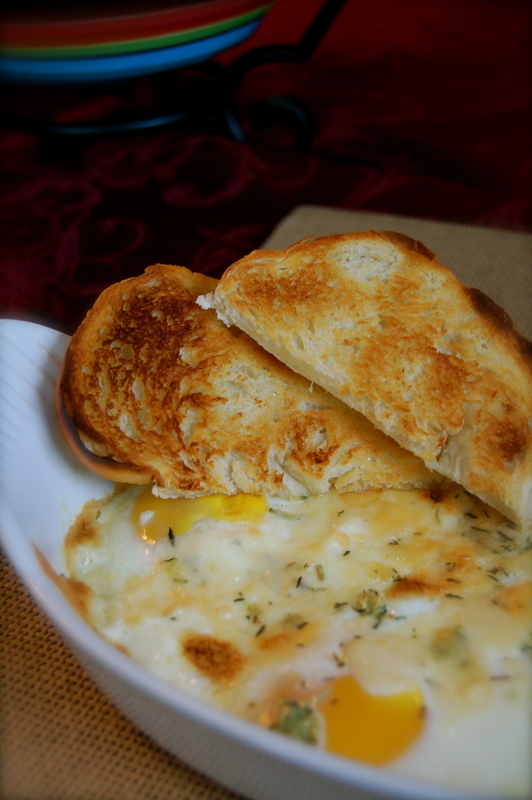 There are a couple of things that I should tell you about baked eggs. First, we served them today with toasted sourdough bread with a little bit of butter on it. Eggs are also a very personal thing and you may like them more runny or seasoned less. That’s the cool thing about this recipe. Just use what you like and keep your eye on the eggs as they bake and you can’t go wrong. If you want to go totally Goodfellas on this recipe, simply slice the garlic really thin with a razor blade. It will make you feel tough – especially if you follow our lead and serve them with whisky. Combine the garlic, thyme, rosemary and Parmesan in a small bowl and set aside. Carefully crack 3 eggs into three separate bowls or teacups – you are just making sure the eggs are good, you won’t be baking them in these. Be sure to not break the yolks. You want to have the eggs ready before you start so that you can move quickly. Place the gratin dish on a baking sheet. Place 1 tablespoon of cream and 1/2 tablespoon of butter in the dish and place under the broiler for about 3 minutes, until hot and bubbly. 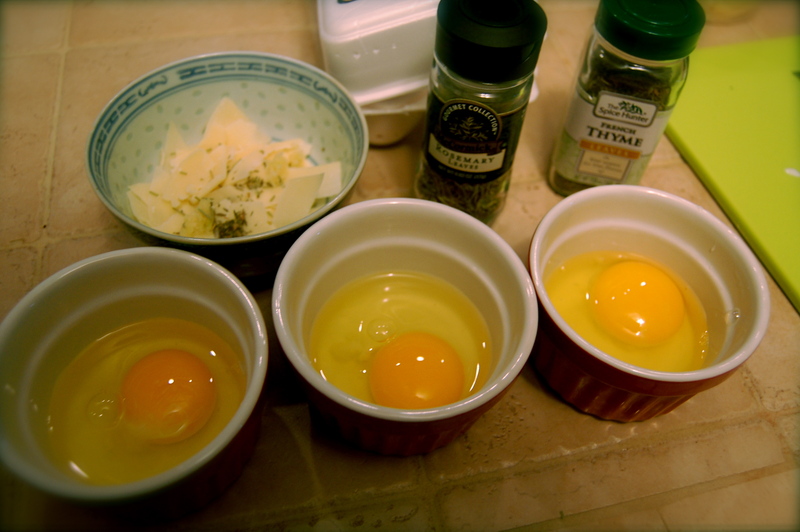 Carefully, pour the three eggs into the gratin dish and place under broiler for 3-4 minutes. Pull out the oven rack, sprinkle evenly with the herb/cheese mixture, and then sprinkle liberally with salt and pepper. Place back under the broiler until desired doneness. Just watch the whites and make sure they are not runny. Rotate the baking sheet if they aren’t cooking evenly. The eggs will continue to cook after you take them out of the oven, so it’s all about how you like your eggs. 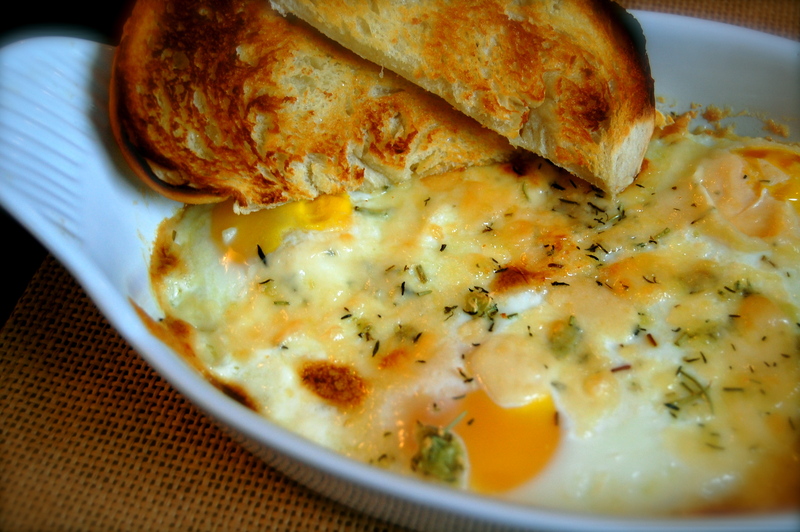 Allow the eggs to set for 60 seconds and serve hot with toasted bread. You should also note that according to the Friendship Blogging Treaty of 2009, there are no photos of Angee today. It was tempting, but she has pictures of me too, so it wasn’t worth the risk. You really shouldnt rub it in about the freakin laptops!!! I made the eggs for Matthew, Maxwell, and me today. A HUGE HIT!!! that spelling has been bothering me too..
who the hell owns two pink computers. What you drinking girl.